Why is the ampersand not showing correctly in Google search results description? 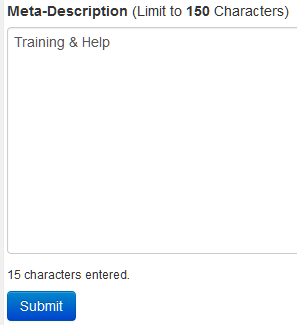 The reason this happens is if the meta-description is not filled out it will be auto-generated using page contents. The webpage editor replaces ampersands with the HTML equivalent which shows incorrectly in search results. Step 1) Find the pages that are showing incorrectly. 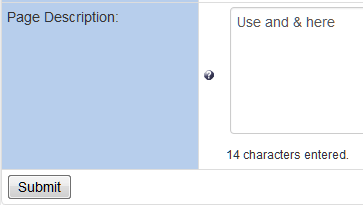 Step 2) Edit the page meta-description using a regular ampersand or the word 'and'. The image below shows what an ampersand in HTML looks like. 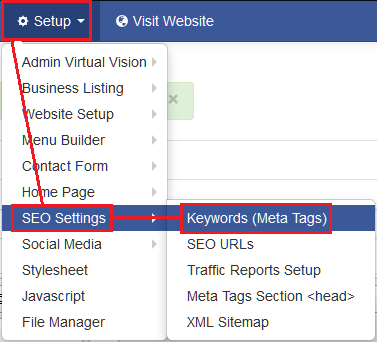 Step 3) To edit the home page meta-description, click on Setup in the top menu bar, then hover over 'SEO Settings' and then click on 'Keywords (Meta Tags)'. Step 4) Scroll down to the bottom where the heading reads 'Meta-Description' and edit the HTML code for the ampersand to a regular & or the word 'and' then click 'Submit'. Step 5) For web pages click on Apps in the top-menu bar and then click on 'Web Pages'. Click 'Edit' next to the webpage to edit. Step 7) Request with your account representative for a 'Fetch as Google' to be completed, this will speed up the indexing of the description of your page in Google Search results.